Come meet Knapsack. 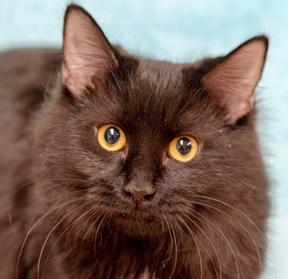 With her beautiful eyes, silky coat and loving nature, she could be the adoring little companion you have been waiting for. Knapsack does well with other cats and would be happy with another kitty companion in the house. If you are looking for a pair, consider Knapsack and one of her sisters, Clutch or Satchel. Time to go Home 4 the Holidays.